Ships from and sold by Pet Supply Store USA. 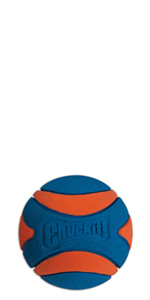 Featuring a built-in squeaker, the Chuckit! 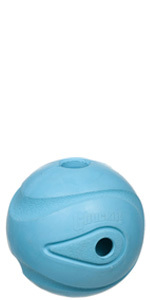 Ultra Squeaker Ball grabs dogs' interest for engaging games of fetch. 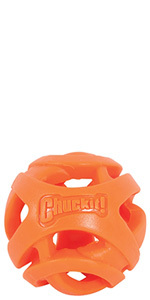 Made from durable rubber, the Chuckit! 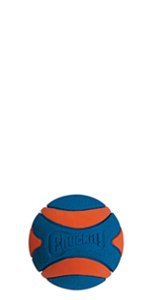 Ultra Squeaker Ball bounces high for pets that love to leap and chase. The Chuckit! 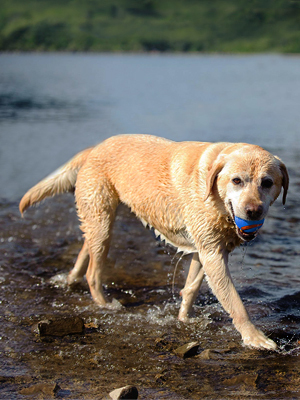 Ultra Squeaker Ball's buoyant design makes fetching even more fun for water-loving dogs. 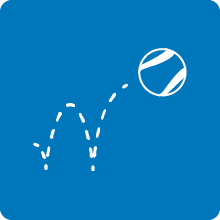 For longer throws and slobber-free pickup, Chuckit! 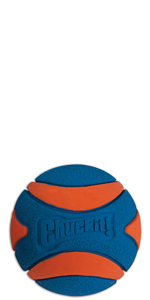 's Ultra Squeaker Ball fits a wide range of Chuckit! 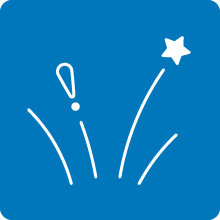 Ball Launchers, available for purchase separately. 2" x 2" 5" x 5" x 2.2" 2.5" x 2.5" 2.5" x 5.4" x 6.5" 3" x 3"
5.0 out of 5 starsDog loves it! My dog definitely loves it! Couldn't stop playing! 2.0 out of 5 starsBroke in 1 day. 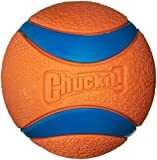 We have a few varieties of Chuck it balls and our dog loves them and they last forever so got this squeaker ball but in one day the bit that squeaks broke. I expected more from a company that makes pretty much indestructible dog toys. 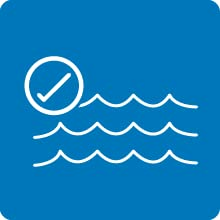 1.0 out of 5 starsThink Twice Before Buying!!! Think twice before you purchase this for your dog! I own a 38 pound 16 month old herding dog who loves to fetch, play ball and run with the ball. 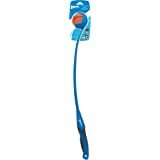 Previous reviews touted this toy as durable, but my small/medium size dog had the squeaker out in less than 5 minutes and damn near swallowed it. When I took the ball away and inspected it I was very surprised to see cracking all the way through the ball and a gaping hole where the squeaker had been. 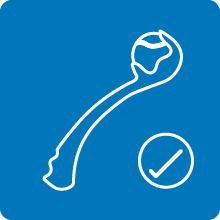 The squeaker is actually glued into the hollow ball by means of a rubber plug, sort of the way soles are attached to running shoes. Just like on your sneakers if a corner lifts up from the shoe you can easily pull the rest of the rubber off which my dog did in a matter of minutes. Problem is with the squeaker out you have one hole that's just perfect to create a vacuum where your dogs tongue can get trapped inside the hole and can lead to tissue death/necrosis and possibly be fatal. Seriously after more research I find out Im not the first to have this happen and yet nothing has changed with this design. I'm surprised Amazon still carries this product. 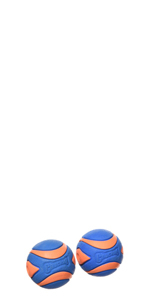 Others have reported this much earlier - wish I'd seen those reviews before. Come on people lets either fix the design or stop selling this product! 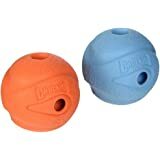 My dogs have played with chuck it balls for years BUT this chuckit ultra squeaker should be removed from the market after dogs have died due to the suction created from the hole pulling the dogs tongue in.The design is not new and could be fixed by eliminating the hole or adding another hole. My 2 year old spaniel is in an animal hospital now and I am awaiting a call from a surgeon to see if he can remove the dead skin from his tongue and still leave enough so that he will be able to eat.If he cant eat he would be put on a feeding tube for the rest of his life or put down This is horrendous and not excusable.Please do not sell products that have proven to kill dogs. 4.0 out of 5 starsGerman Shepherd approved! 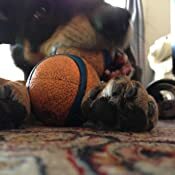 This is my German Shepherd Dog's favorite ball. The bad part is the squeaker broke fairly quickly. The good part is the squeaker broke fairly quickly lol. Even though it doesn't have the annoyingly loud and high pitched squeak anymore he still loves it. There has been no damage done to the ball despite his constant chewing. I have bought a second so he can have one dirty one outside and a clean one inside. UPDATE: Both balls (size large) have stopped squeaking which is just fine with me. It is still his favorite ball. I have had the first one almost a year. There is not a mark on either ball and he is an 85 pound shepherd that is super tough on toys so I would highly recommend it if you don't mind that the squeaker will break quickly. 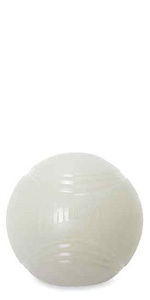 UPDATE: I have now purchased 3 of these balls (2 large and 1 medium). 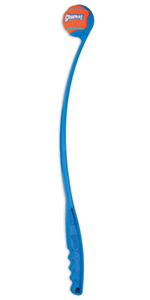 The newest one is the size medium so it can fit in the chuckit thrower. Again, the squeaker broke within minutes but my dog doesn't seem to care. 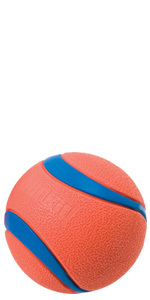 If you want a squeaky ball that will never stop squeaking this probably isn't the toy for you. Even with the squeaker broken it is still hands down his favorite ball (thus why I now have 3). I have a different rubbery ball that still squeaks and for whatever reason he still prefers these, go figure! 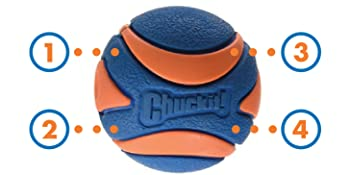 I like this toy, the quality is consistent for Chuckit. My dog loves the chuckit frisbee's but this toy we are working on. No problem with the ball, just that my dog would rather chase a frisbee. Including a picture with the Chuckit medium ball on the far right, baseball to the left, the Ultra squeaker large left of baseball and extra large regular ball far left. 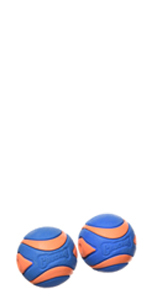 The squeaker works fine on the ball. 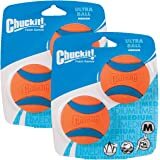 The Chuckit rubber balls of all types and sizes are by far the most reasonable priced durable dog toys of any I have ever purchased. 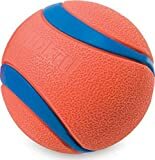 My dog has a collection of them and will not pick up let along play with any other brand ball. She know the difference of each even if they are the same size and shape. Depending on her mood she gets her mind set on the "squeaky" while of times she wants the "whistler or the erratic" and will search the entire house till she finds the chosen one. She accepts no substitutes even if they are right under her nose! Reminds me everyday how smart dogs are. I have replacements of each hidden away just in case one disappears to avoid having to go to a pet store immediately to find an emergency replacement that they may or may not have in stock. So far we have all the originals brought 3.5 yrs ago as they are never far from my dog. 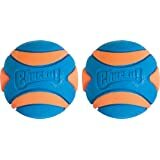 Other then dog food, collar, and leash Chuckit Balls are the are a must I'm my house.